​Abbey Brook is National Collection holder of this genus. The collection has been built up since 1960 from vegetative material of known origin. The collection includes plants propagated from type material and from habitat. There is even material from plants which can be traced back to Victorian times. 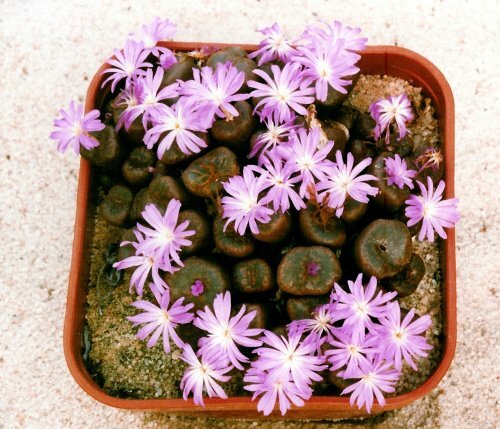 The collection contains plants from a number of notable collections including N.E.Brown via J.T.Bates, Dr. Tischer via Dr. H.W.de Boer, and also from the Steven- Jones collection obtained in its entirety in 1976. This included plants from Louisa Bolus, Hans Herre, Harry Hall, Vera Higgins, Bates, de Boer, and may others. All our plants have an ABCN accession number which refers to a particular plant collection. W e rarely grow these plants from seed, which unless directly from habitat, can produce plants which are taxonomically worthless. 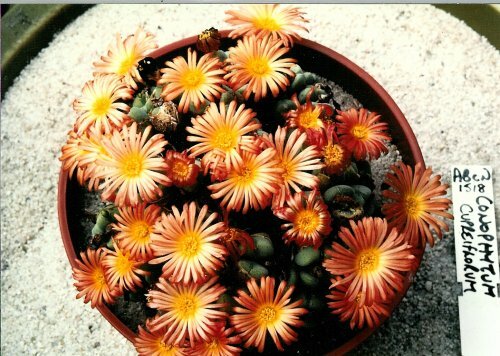 The following is a list of Conophytum plants propagated from the National Collection. Always keep the accession number with these plants, which can then be referred back to a particular population of known origin. We sell the plants under their original names as received, as the taxonomy of this group is by no means fixed. Many of the recent proposed name changes and name reductions are not set in stone and are not consistant with the wide variations exhibited by these plants. The reappraisal will come in the next 5 years with the publication of the first useful analytical key to the genus.